There are many powerful tools and technologies surrounding the Web, and we can reuse them to develop cross platform mobile and desktop apps, especially in light of installable apps appearing on platforms such as Firefox OS. This article looks at the best way to do this, and presents Webapplate, a powerful new template to help facilitate this. As is the nature of the whole web, web apps are simple to write but hard to get done right. Even though the Web doesn’t provide an SDK or simple ready-to-use templates like other mobile platforms, you can still come out with a workable web app from candidates like Mozilla Open Web Apps, Chrome Apps, or Apache Cordova. But developers who want to quickly build a web app usually take longer time than say, an iOS developer. Firefox (desktop), Firefox OS, Firefox for Android support hosted web apps. Those web apps could be hosted on a static or dynamic web server just like normal web sites. Hosted web apps don’t allow some certified web APIs such as the TCP socket API because of security concerns. Firefox OS and Chrome (desktop) support packaged web apps with different APIs for different purposes, because currently they focus on different types of devices. Cordova provides device adapters for many platforms, including Android, iOS and Firefox OS. Google has its Cordova variant to adapt Chrome App’s specific APIs to run on Android devices. In quick summary, the web app concept is not totally unified yet, but powerful enough to compete with native apps. Currently packaged web apps are mainstream because of the security concerns with new web API’s. Mozilla is mainly focusing on exposing new web APIs to mobile devices, Google is developing new web APIs for desktop. Apache Cordova is a good container to expose web APIs to different platforms. To make things harder, provided examples are often focused on teaching you how to pick up new web APIs rather than utilizing proper web app concepts with your development process. I’ve had the chance to join the development of an evolving web app project called Gaia, the Firefox OS user interface. The Gaia project contains the very first Mozilla installable web app implementation, including apps for music, photo gallery, e-mail, calendar and much more. According to GitHub’s pulse monthly, there are about 850 commits per month to the Gaia web apps. In the Gaia project, Mozilla developers and community members devoted lots of time and effort to bring it from the prototype stage to a shippable product within 2 years, and iteratively make it a competitive option for smartphone consumers. As a living large web app project, there are many lessons that can be learned from it, and applied to general web app development. Those are topics that need to be resolved to develop a quality web app. In Gaia we have addressed these issues by utilizing a bunch of build scripts (Makefiles). You may wonder why we didn’t use Grunt or gulp for building? The answer: at the time Firefox OS was started, these tools didn’t exist. And the module owner wanted to make the core build process run in a Firefox extension one day. For general web app development, we didn’t have to follow those constraints. And we could do some experiments rapidly by reusing 3rd-party tools and libraries. From 2013, I’ve initiated a side project called webapplate, the open-sourced web app template that attempts to make Gaia’s solutions compatible with emerging toolkits like npm, Grunt and Bower. It also tries to transport good practices from Gaia to make new web apps more maintainable. to install the primary tools. Karma is the test runner that runs test code for each of the browsers. karma.conf.js defines the detail settings to specify how the test runner goes. npm will reference package.json to install all dependent node modules. The command will trigger Bower to install client-side library dependencies as well. 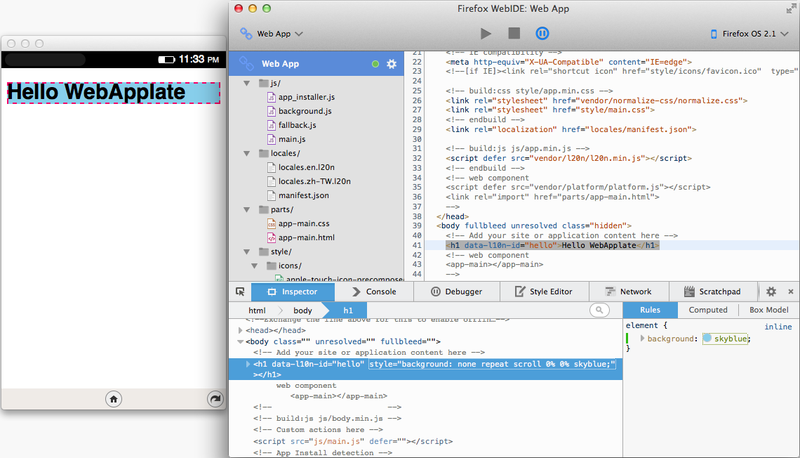 If you use Firefox nightly, you could open the webapplate/public folder as a packaged app in the WebIDE developer tool. 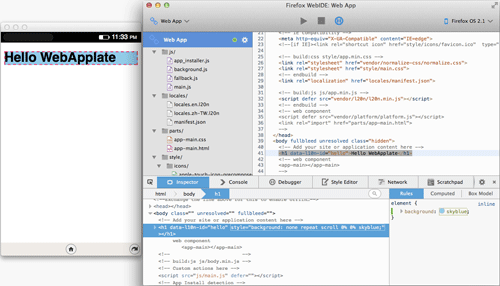 WebIDE allows you to edit, debug or execute your web app in the Simulator or on the device, with your favorite Firefox Developer Tools. With the Chrome Apps & Extensions developer tool, you can import the webapplate/public folder as a Chrome App and check the UI on desktop. The very first good practice that Gaia and webapplate provide is git pre-commit lint checking. to bind the git pre-commit code style check to your development process. 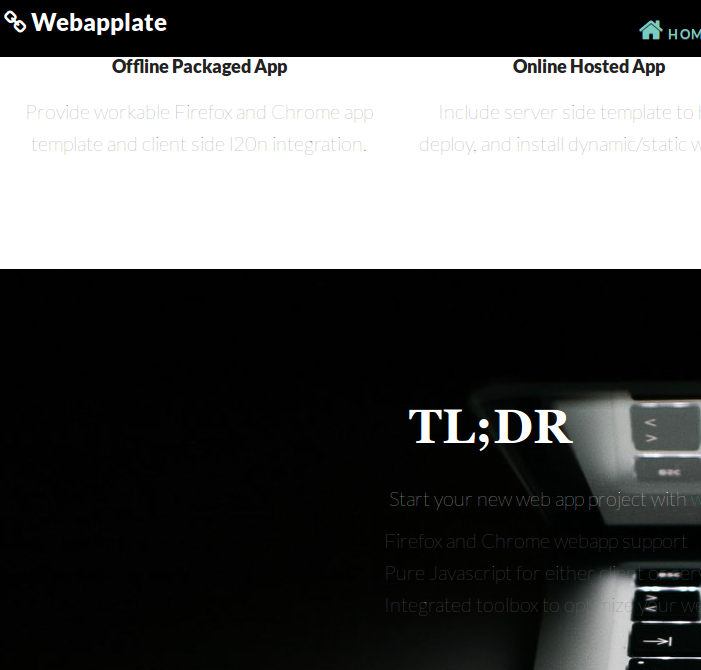 Webapplate uses HTML5 mobile boilerplate as the template base, and adds web app install helpers, icon links and usemin annotation for web app optimization on top. The main web app source is located in the public/ folder. You could check the webapplate wiki to see the full webapplate structure. 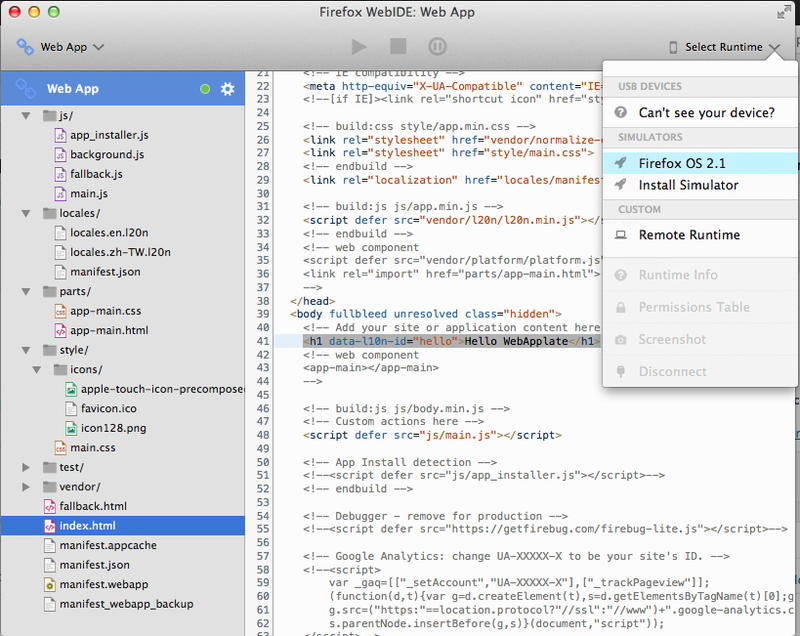 Currently, Firefox web apps use manifest.webapp and Chrome Apps use manifest.json as the manifest file. The syntaxes are mutually compatible, except the localization part (we’ll address this issue later). to overwrite manifest.webapp with manifest.json, or viceversa. to package your web app to an uploadable zip file. With the default settings, webapplate-generated packaged web apps could be uploaded to the Firefox Marketplace and the Chrome App store. For Gaia we manage development tools via npm and generally don’t use many 3rd-party client side libraries. We host commonly-used libraries between apps in a shared/ folder, and then copy them in at build time via a build script. webapplate defines these libraries in package.json, uses npm to require build tools, and doesn’t assume any app framework (e.g. Backbone or Angular.js, or a UI framework such as Bootstrap.) Client-side libraries could be managed via Bower in bower.json. Since web apps might be run without an Internet connection, we can’t count on the server to detect multiple languages. Currently Firefox OS uses navigator.mozL10n and Chrome Apps uses chrome.i18n for localization. Both of them are non-standard. In webapplate we take the l20n library to address the client-side localization issue. l20n is crafted by Mozilla and the developers are currently working on enhancing the Firefox OS localization framework as well. Also, check out the Multiple Language Support Framework section for how l20n is integrated with webapplate. Gaia uses its own test-agent to trigger unit tests on Firefox. Gaia uses the Mocha test framework, Chai assertion library and the Sinon test helper library for unit tests. Webapplate uses the above unit test libraries plus the Karma test runner to run unit tests on all mainstream browsers. will trigger the Express-powered server with django-like Swig template support. It’s been pre-configured for performance. Measure with YSlow and you’ll get a pretty good grade for your web site. Webapplate has been tested on some free dynamic web page hosting providers such as openshift, heroku and appfog. Check the deployment section to find out more details. to generate optimized web pages for hosting. Start your new web app project with webapplate! Fred Yu-Min Lin, a.k.a. "gasolin", is a front-end web developer working on "Gaia", the user interface for Firefox OS. He is also the book author of Android and FIrefox OS Gaia development. He regularly blogs at http://blog.gasolin.idv.tw and gives presentations to share open web and mobile technologies. I must admit this looks pretty good. I will definitely give it a try. Firefox OS -> Chrome App and vice versa can be really useful since it automatize a lot of manual labor. Hopefully the day will come when manifest.webapp/manifest.json is standardized and supported across browsers so web apps become first class citizens on all platforms. Thanks! Please try it! And good news: manifest standardization is on its way! It’s too complicated. Grunt, Karma, Bower, Npm, Node.js, Mocha – all of this just to make a single web app in HTML5? It’s not what is required, but it is an option that makes workflow and maintenance easier for a lot of people. It all depends on your needs and priorities. So can I use Webapplate without them? So can I use Webapplate without them? I don’t think so. Like states addressed in ‘Why invent the wheel’ section, for single web app, you could start with any existing webapp generator to come out with a workable webapp in little time. So does webapplate. This article contains more tech sharing so it mentioned lots of details. Things like Karma, Mocha are for unit test purpose, they need to be installed in development but you can use Webapplate without them. Because those mentioned tools are well integrated in webapplate, you don’t need to know every detail of them. The key webapplate differentiate from others is `maintenance`. Once you released your web app, going to the maintain state and get headache about the code quality, those tools are integrated for you. You can hack them later when you need it. More useful to me would be a tool that could take my existing web app project and add one or more of these capabilities. Yeah it will be helpful. I think its doable once web app developer follow similar conventions such as same app folder structure, so tools could use those convention to apply some capabilities to existing project. At this time I encourage you to check how webapplate integrate those capabilities and port it to your existing project. From 1.7, I start separating grunt options and tasks. So one day we could create command tool that allow developer only pick some features and add one or more once they need more capabilities. I wonder if you’re aware of Yeoman and, if so, why you did not make this as a generator for it? Yeah there is the `generator-webapplate` project under https://github.com/webapplate , but not ready for primary use yet. I’d wonder if it easier then just copy and download the template. You could fire issues in https://github.com/webapplate/webapplate.github.io for website bug. It needs more investigation since I can’t reproduce it. The required components are pre-fetched by bower. You could uncomment the web component part in `webapplate/public/index.html` and use it now. The app-main component is defined in `webapplate/public/parts/app-main.html`. The limit (for 1.7) is the code optimization process is not ready for web component yet, and web component platform.js shim(both polymer/brick use this) has CSP violation issue for packaged webapp. So you may need to take care your own if you want to use web component for packaged app now. Note that Gaia Building blocks is being deprecated (but still works) and will be replaced by gaia-elements in the future release. Sadly gaia-elements has no plan for cross platform support yet. This is a followup to one I posted on Github about a year ago – http://repres4fxos.github.io. It probably does have to be able to go out to the web but the rest of the requirements are quite modest. I just need it to have an app-like style rather than a slide show.